The first „Lightart Biennale Austria 2010“ is a non-commercial exhibition of lightart. There are light-artists as well as visual artists who uses light as an art-medium. The Biennale 2010 is using the slogan „private light in public spaces“. The start of the Biennale will be September 1st in Linz and September 4th 2010 in Perchtoldsdorf, with a final exhibition in Vienna in November 2010. We keep the public informed about the Biennale with a Blog, a Website and a planned printed catalogue. The submissions can be watched on www.lightart.posterous.com. 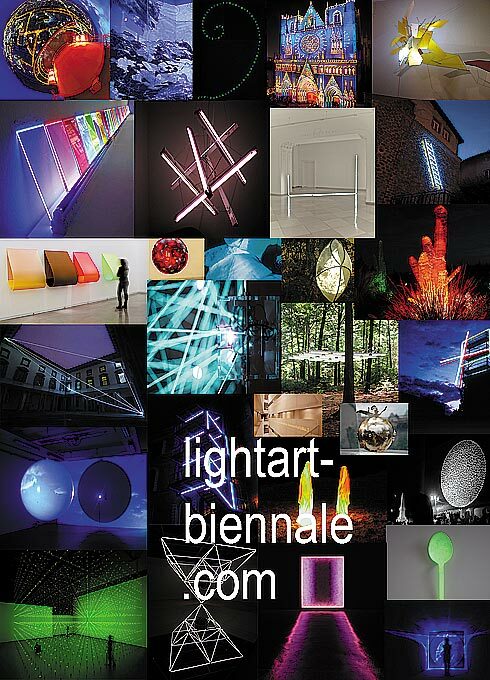 Selected artists and exhibition spaces can be seen on www.lightart-biennale.at. Artists from 4 continents and 21 countries have been selected by now. City Galerie www.citygalerie.at 2-11 Sep.
Galerie am Schillerpark www.antikhaus.at 2-11 Sep. The name of the biennial describes the technical medium being used could also be interpreted in another manner. Light art – art without substance, this could be understood as unserious art. It could also be interpreted in another way. Art without substance is art about the immaterial. The object can be seen but never touched. But is it unserious? Milan Kundera wrote a book called “The Unbearable Lightness of Being” – And so comes the heavy part of the project. Light is about life – without light there is no life. The light of the sun fuels the planet. Light is a symbol used in churches for life itself. Some catholic churches begin their midnight Easter services in darkness. Then when the light of the rising sun comes through the stained glass window the worshippers light candles. The light then goes from one person to the next. This is how life and energy works. The seed of the man impregnates the woman and thus begins a new life. But the energy is there before. – the burning desire of the individuals for each other – this energy is the fuel of life. When we look to the sun as for example Olafur Eliasens: “Sun” at the Tate Modern we find calmness. We are reassured that everything is all right. So is it with light art – we find a space for solace and contemplation or just a pleasing view – whatever we find – we are enriched – such is the nature of light art. Linz is the perfect venue for a departure into an area filled with light art. When you arrive in Linz by boat you are greeted by several great examples of light art. Lentos Art Museum and Ars Electronica Center each on their own side of the Danube with light incorporated into their facades. Lentos the older building and is probably the inspiration for the facade of Ars is at night a pattern of blue light which at night with its reflection in the Danube is absolutely beautiful. The Ars Electronica Center with its every changing display is a real experience. But there are also other lights incorporated in the architecture, which are truly pleasing to the eye. The bridge across the Danube is also worth noticing. Thus with the palate wetted and greeted by the city of Linz we can step off the boat and begin to explore the city of Linz and the artworks placed into the public spaces by the artists of the festival.